In the Women's T20 Smash Thailand today, Nepal defeated China by a huge margin of 10 wickets.Neplease bowlers showed a great performance and restricted China in just 48 runs. Neplease captain Nery Thapa and Karuna Bhandari showed superb bowling to restrict China in such low score. In the Asia Institute of Technolgy ground today, Nepal won the toss and elected to field first. In the 20 overs, China was able to make just 48 runs in loss of 6 wickets. Karuna Bhandari picked up three crucial wickets. Meanwhile, Nery Thapa grabbed to wickets. Karuna bowled four overs conceding just nine runs and got three wickets. Meanwhile, Nery bowled four overs with two maidens, she gave just six runs and picked up two wickets. Jhan Chang scored 13 runs or China; no other batswomen were able to contribute double-digit runs. China scored only three fours in the inning. 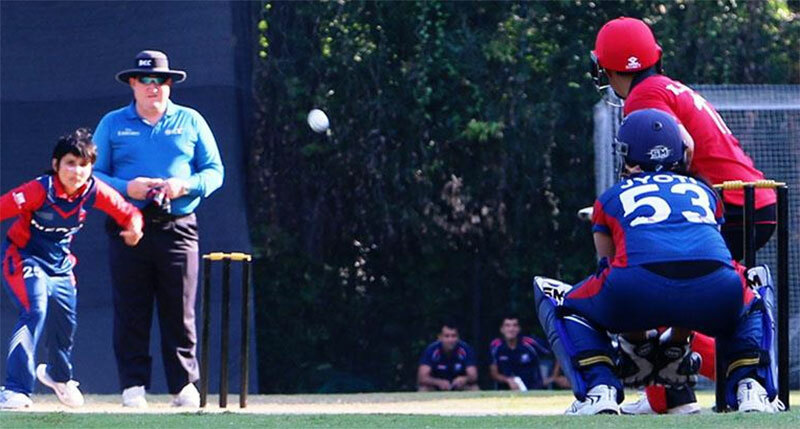 Chasing the target of just 49 runs, Nepali opener duo Kajal Shrestha a Sita Rana Magar brilliant performance helped Nepal to reach the target in just 8.4 overs. Kajal scored 14 runs with the help of one four and Sita scored 24 runs with three fours. Karuna Bhandari was elected Player of the Match. In this T20 Smash Tournament Thailand, Nepal, Bhutan, Hong Kong, China, UAE, Malaysia, Thailand, Indonesia, and Myanmar are taking part. These teams are divided into the two groups, and Nepal is on the group A with China, Malaysia, UAE and Thailand A.